Captain Thomas Peter grew up fishing in the Marigot Bay on the west coast of Saint Lucia. 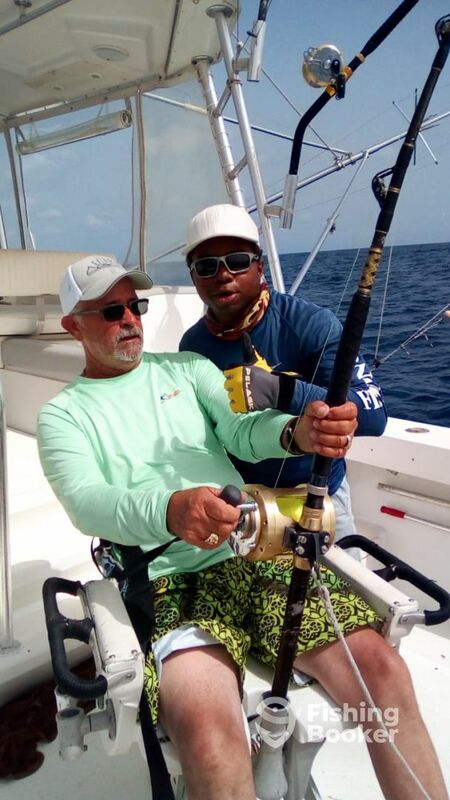 One thing led to another and he was working in the Rodney Bay Marina, where he discovered his love of taking people on amazing cruising and fishing trips and showing them a fantastic time. 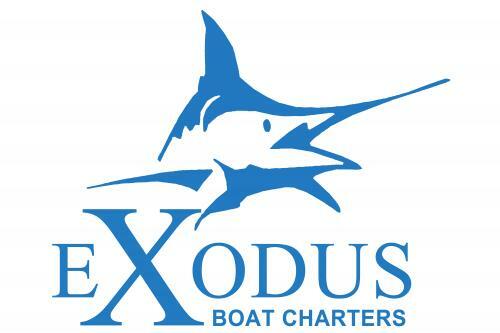 He began Exodus Boat Charters in 1998 and things only started getting better from there. Now, he's supported by Captains Dell, Jeremy, Bobin, and Curvin, as well as the ever-ready first mates Shernell, Garvin, Dave, Arnold, and Kensley. 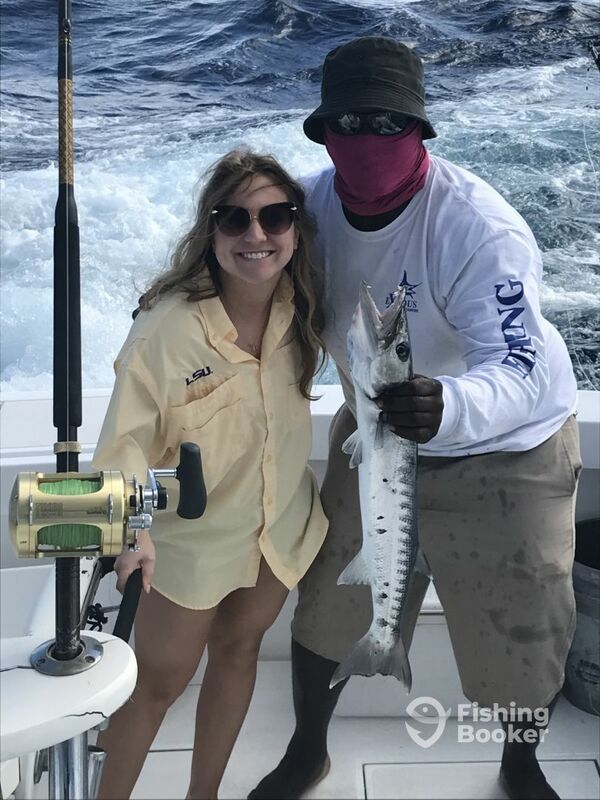 They're a big fishing family now but their priorities have never changed – giving their guests the best trips they can while providing premier service! If you ever get to meet these two or fish with them don’t give up the opportunity. I tried to book them again the same week , they were booked. My loss. My wife and I had a great time, both the captain and the two 1st mates were very professional and worked hard. I would go with them again if I am ever back down in St. Lucia. Sea was rough 4-5 foot swells, but it is what it is. 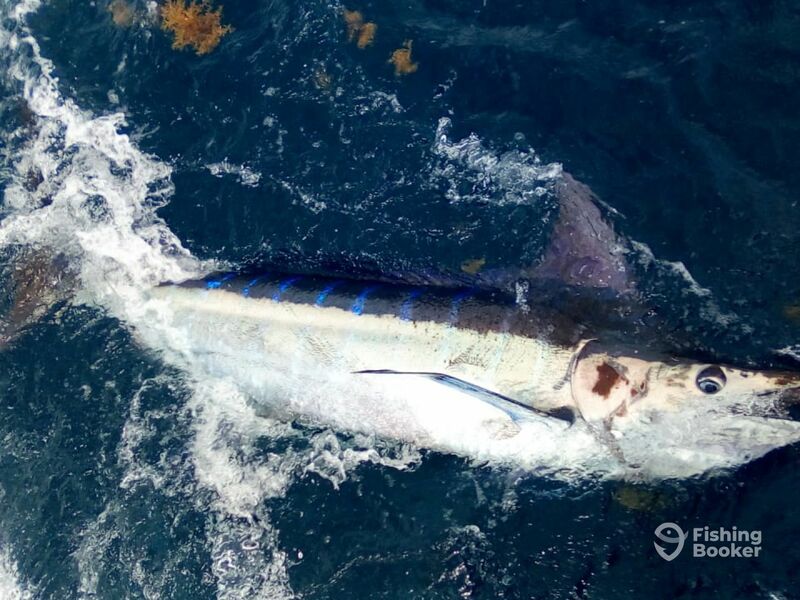 300 Lb Blue Marlin and 10 Mahi Mahi and 1 amber jack, could not have been any happier! I ve been out a lot deep sea fishing in the past 7 years and I will have to say this was the best. We have always went out for just half days, But if you really want to enjoy the experencie you need to do a full day. We went out with Capt. Dell and 2 hands Sea was rough 4-5 foot swells, but it is what it is. 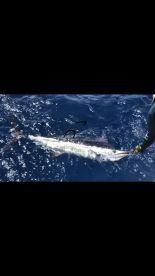 We caught our1st fish about 10 am but, at the end of the day I landed a 300 Lb Blue Marlin and 10 Mahi Mahi and 1 amber jack, could not have been any happier! I ve been out a lot deep sea fishing in the past 7 years and I will have to say this was the best. We have always went out for just half days, But if you really want to enjoy the experencie you need to do a full day. Thank you Mr Marable for your kind feedback. 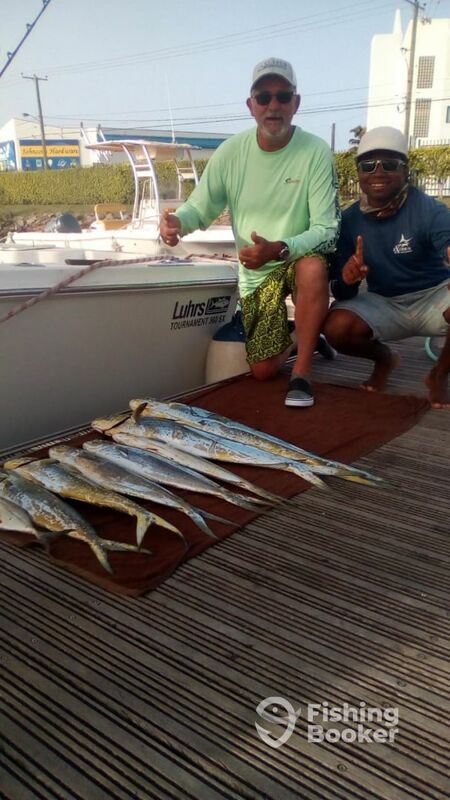 It was great to have you on board and to fish with you! The only reason I didn’t give five stars across the board is that we had only one strike in the entire four hour trip and that was gone by the time I was in the chair—never even felt the fish on the line (whatever it was). Crew were great and everything was very professional, but just no luck. That’s fishing. 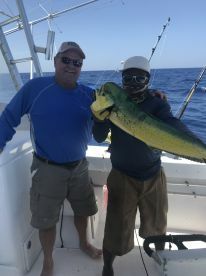 Captain Dell and first mate Arnold worked so hard to get us to the fish. 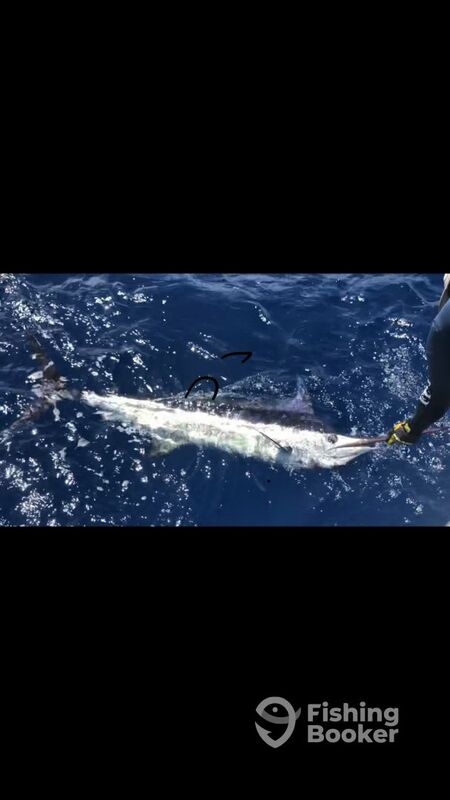 We hooked three Blue Marlins at one time. 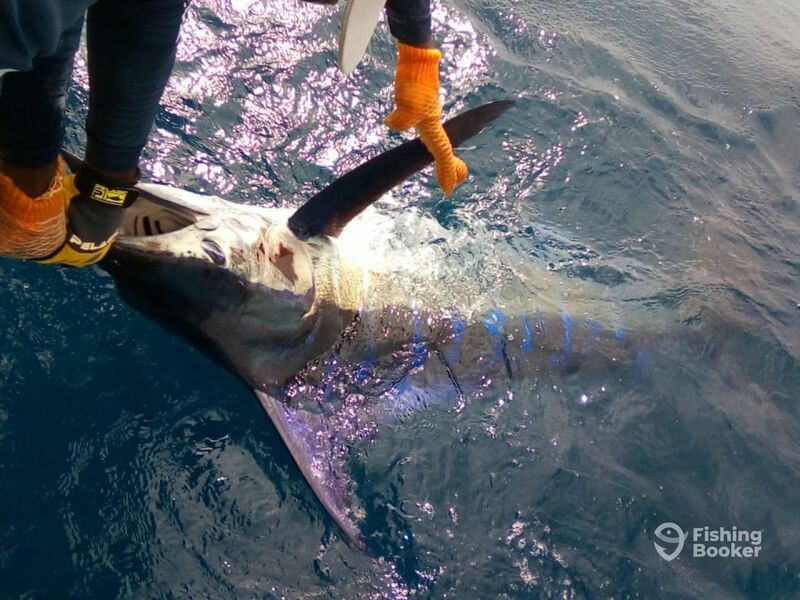 Unfortunately we lost two fish but we’re able to land a two hundred pounder. 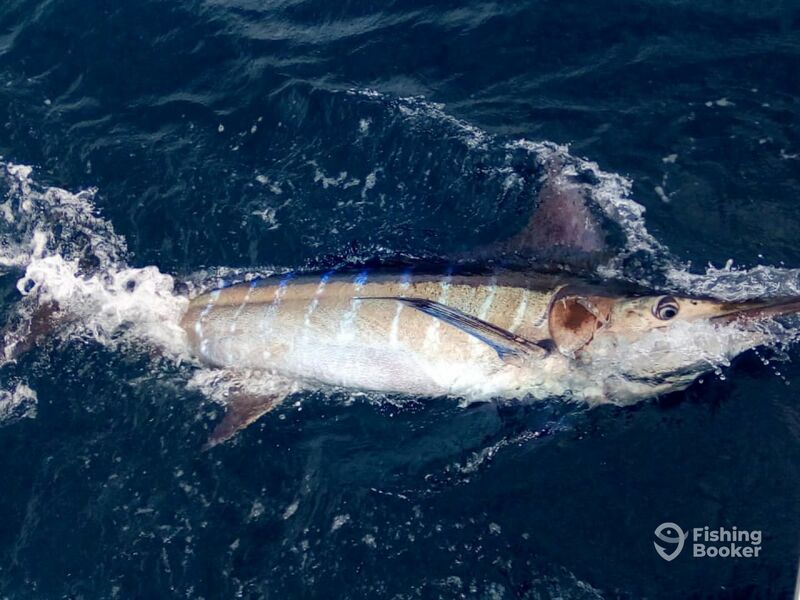 We also caught two Barracuda and a nice 30-49 pound Wahoo. This was an awesome experience. My third deep sea fishing trip and By far my best experience.